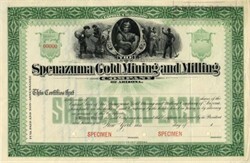 Beautifully engraved RARE SPECIMEN certificate from the Spenazuma Gold Mining and Milling Company. This historic document was printed by American Bank Note Co. and has an ornate border around it with a vignette of miners working lode and placer claims. This is the first time we have seen a specimen from this company for sale. Dr. Richard Flower was a former snake oil doctor who made a fortune until the government started enforcing standards in selling bogus medical related products like snake oil. Dr. Flower was forced to find another scam so he went into the gold mining business. Flower was from New York and his associates had sold stock for a mine in Arizona. Dr. Flower was said to have chosen the name �Spenazuma� because he wanted easterners to "Spend" their �mazuma� (money) in his enterprise. The scam was exposed by George H. Smalley, publisher of the Tucson Citizen Newspaper. Results of his six-month investigation were published in the Citizen and in papers across the nation for which he was free lancing. Smalley disclosed that a Dr. Richard Flower from New York and his associates had salted a mine ( made up production numbers ) near Mount Turnbull in the Black Rock mining district of western Graham County, 20 miles west of the community of Geronimo.